This year, one in 80 candy hearts will say, "Tweet Me." But did you know just how vintage these 144-year-old candy hearts are? "Be Mine." "Kiss Me." "Sweet Talk." Nothing signals Cupid's arrival quite like conversation hearts. This year, thanks to the landslide results of an online survey in which the candy's manufacturer solicited suggestions for new messages, one in 80 candy hearts will say, "Tweet Me." Isn't that modern. But did you know just how vintage these 144-year-old candy hearts are? We'll give you a short (and sweet) history lesson: The New England Confectionery Company (NECCO) debuted their Sweethearts Conversation Hearts in the 1800s. Originally called "motto hearts," their precursor was a trendy fortune cookie-like treat sold during the Civil War called a "cockle," which had printed phrases rolled up inside its scallop-shaped shell. Printing words directly on the candy was the bright idea of Daniel Chase, the brother of NECCO's founder. He also invented the machine that both pressed red vegetable coloring on the candy dough and cut the shapes. The new candies were a hit, especially wedding-day versions with sayings like: "Married in Pink, He will take to drink," and "Married in white, You have chosen right." At the turn of the last century, NECCO "Conversation Mottos" were even produced in shapes like watches, horseshoes, and baseballs. Many of the original sayings, like "Be Good," "Be True," and "Kiss Me," are still printed, but NECCO began to update its lexicon in the late '90s with hearts that said "Call Me," "Fax Me," and "Email Me." Last year's new phrases were all food related, from "Recipe 4 Love," to "Top Chef." 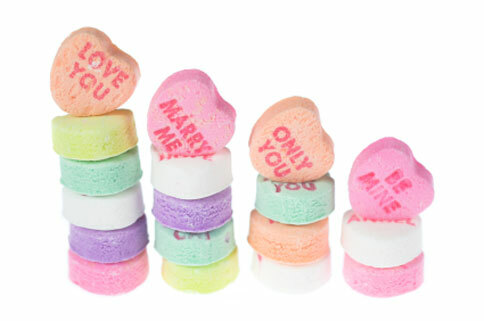 And while it used to be impossible to find the candy hearts during any other time of the year, in March of 2009 NECCO produced Twilight-themed candy hearts, with sayings like "I heart EC," "Lion and Lamb," "Bite Me," "Dazzle" and "Live 4 Ever." If you'd like to personalize your own candy hearts, but don't want to purchase a full production run (approximately 1.6 million individual hearts), take inspiration from the Evil Mad Scientist Laboratories. With a Microplane and rubber stamp kit, the possibilities are endless. If that's a little too crafty for your taste, type your phrase into the Acme Heart Maker for a virtual conversation heart. What can you do with virtual candy? If you can't eat it, at least you can tweet it.